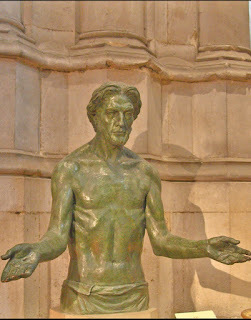 Especially in the Christian tradition it remains acceptable to deal with faith positions that are very different from ours by rejecting, condemning, excommunicating these. I prefer to relate to left and right in love. In this piece I suggest that the metaphorical character of faith language allows us to be more radically ecumenical than we often think. Loving our neighbour whose faith excludes ours is difficult at times, but leads to fulfillment when we embrace God as Love. 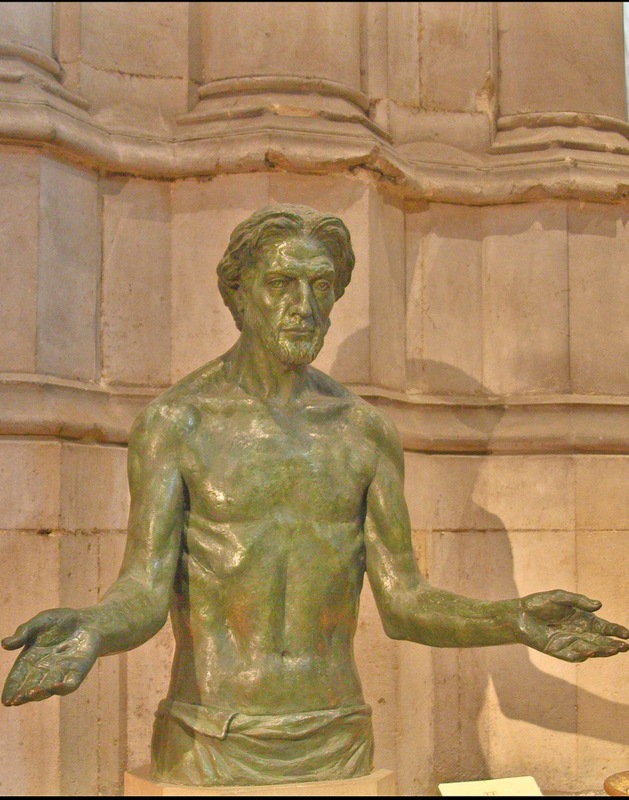 The contemporary Jesus sculpture is from the 8th century cathedral in Ely, England. The outstretched arms are a loving invitation to all. In my spirituality I embrace metaphor more and more as I get older. This means in part that I am more patient with people whose metaphors differ from mine, as well as with people who tend to a more literal stance. Since metaphors abound, there seems no need to insist on the ones I embrace. What matters to me is that within their articulated position people find what they should expect from their faith: sustenance, redemption, hope, peace, joy, etc., and that they should welcome others with different articulations. As I get older I am also increasingly impressed with how historical our faith is. None of the positions we take will last. Our theologies, our hermeneutics, our sense of what redemption is, etc., etc., continue to change. So I value a faith that speaks to us in our time and does not hang on to metaphors that spoke to earlier generations. I have learned to see that we need to be more and more ecumenical across the spectrum. Instead of being more open minded to and accepting of people who are progressive like we are, we can be just as open minded to those who are more conservative. In all of this I do, of course, need to make choices. I may respect Native American spirituality and learn from it, but I am Christian, and my allegiance calls for integrity toward my own tradition. So to guide me I take the Bible seriously, because within Christian faith the Bible is a touchstone. But I do not take this to mean, e.g., that I need to make sense in contemporary faith of whatever the Bible mentions as important. It may be important to discuss the relation of God's wrath to God's love when talking to Christians who take that wrath more seriously than I do. But in today's world I do not consider it my Biblical duty to dwell on God's wrath, or to embody it. So do I still have faith norms and can I be critical of some forms and kinds of faith? I think I can deal with this by embracing God's love as the root of all faith norms and try to relate to people who in my experience depart from the call to love as a disciple of love.